Beals & Torrey Shoe Co.
Scarcely had the guns of the Civil War ceased firing when two young men from Massachusetts, E. F. Beals and I. G. Mann (the former a wounded and discharged soldier) stopped off in Milwaukee looking for a satisfactory location for a shoe jobbing house. 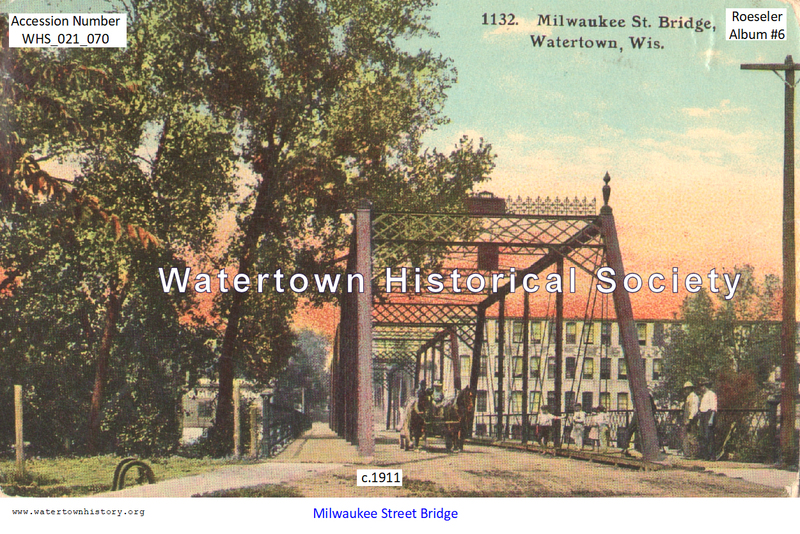 Milwaukee seemed to impress the young men as being the place they were looking for, and they at once completed arrangements for a store at 91 Huron Street, and opened business as Mann & Beals. Later results proved that the selection of Milwaukee was a wise one, but after one year's experience Mr. Mann concluded to retire from the business and his place was filled by J. L. Beals, a brother of E. F. Beals. Their father, E. S. Beals, and Alexix [Alexis] Torrey having connected themselves with the firm, it was known as Beals, Torrey & Company. Alexis went to San Francisco at 21 for the gold rush, came back and started the shoe business and was clearly very successful. He invested in many things and enjoyed a long and full life. The Torrey’s were in the shoe business in Weymouth, MA. 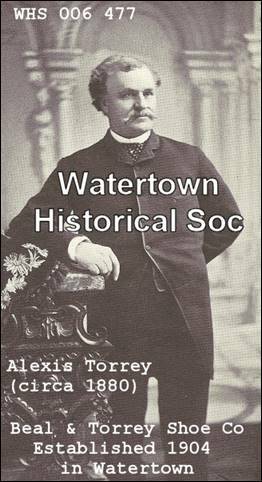 Alexis Torrey was very successful and invested in many things of the day. Alexis’ sister, Emily, married Elias Franklin Beals of Milwaukee. Emerson Torrey, Alexis’ son, went to Milwaukee to work with his uncle and remained there. The inventory of Alexis’ estate listed 500 shares of Beals and Torrey Shoe Company. Elias Franklin Beals was born in Weymouth in 1841 and died there in 1906. He married Emily Catherine Torrey, sister of Alexis and daughter of Lemuel and Nancy S (Bicknell) Torrey. She was born in 1846. Elias Franklin Beals' father Elias Smith Beals had three surviving sons. Augustus stayed in Weymouth. James, born in 1848, is listed as removed to Milwaukee, Wisconsin. Elias is not listed as moving to Milwaukee. James presumably went before him. Their father Elias Smith Beals (1814 – 1897) held many prominent positions in Weymouth and was a shoe manufacturer for many years. Weymouth, which is fairly near Plymouth, is one of the oldest settlements in the United States and has very extensive historical records. This information pretty much confirms to me that the family name is correctly Beals as opposed to Beal as listed in some places in your writeup. At this time the firm opened a factory where were manufactured men's work shoes and women's turned shoes, both high and low cut. This factory was in a building occupying the site of what became Child's Restaurant on Grand Avenue. Upon the removal of the firm to West Water Street in 1888 to a building since razed to make room for Gimbel Brothers Store, the factory was also removed to that building, and was continued there until the entire floor space was required for the increased jobbing business, when it was located on Clybourn Street between West Water and Second Streets and afterwards removed to Fourth Street between Clybourn and Fowler. In the early days of the firm its goods were sold in Wisconsin, northern Iowa and southern Minnesota, E. F. Beals and J. L. Beals covering the territories twice a year mostly by team. Goods sold on the spring trip were collected in the fall, and those sold in the fall were paid for in the spring. In 1897 the business had so developed that it was deemed advisable to incorporate, and so in the spring of that year the corporation known as Beals & Torrey Shoe Company came into existence. In 1904 a desire which E. F. Beals had long been possessed of was consummated and the company erected its own factory at Watertown. For a short time the same class of goods was manufactured in the new factory as had been in the old, but after the death of E. F. Beals in 1906 the new management decided on making a radical change, and devoted the entire effort of the factory to the production of Men's Fine Goodyear Welt Shoes. Under their regime the business so increased that it became evident a larger factory was necessary, but before plans could be carried into effect the war came on and building operations had to be laid aside. As soon as permitted to do so work was commenced on a modern factory, up-to-date in every respect and its completion was reached early in 1920. This factory has a capacity of 2,500 to 3,000 pairs a day and is known as Beals-Pratt Shoe Manufacturing Company. The company is now covering the entire United States and also includes in its territory, Cuba, Mexico and Central America. The Beals & Torrey Shoe Co. of Milwaukee has decided to remove their manufacturing plant to this city. 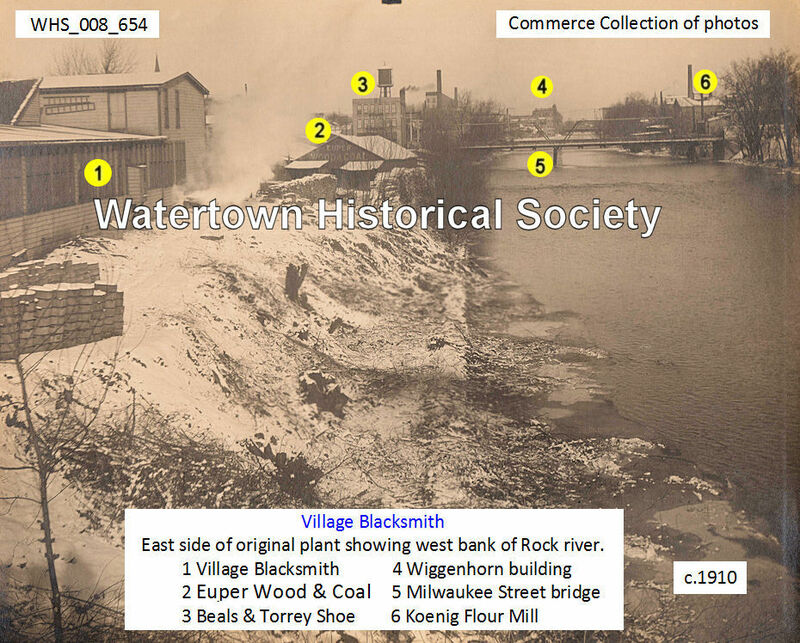 The officers of the Watertown Advancement Association have been negotiating with the company for some time and finally closed a deal with them last week. A cash bonus of $8000 will be given the company, and they will erect a plant here to cost $30,000, and as soon as it is completed 100 men and 50 women will be put to work. The factory will be built on a piece of land just northwest of Milwaukee Street bridge. It is to be four stories high, 200 feet long and about 60 feet wide. Mayor Wertheimer and Fred A. Hoffmann, the soliciting committee, are at present taking subscriptions from our business men and others and it is hoped they will be generously dealt with. This company will from the start pay out about $1 000 a week in wages, which will be of great benefit to Watertown. John Buckley of Emmet has signed $20 to the enterprise, taking an interest in our city because it is his market town and he wants to see it prosperous. We want more John Buckleys in and around Watertown to give a good active boom on this city. 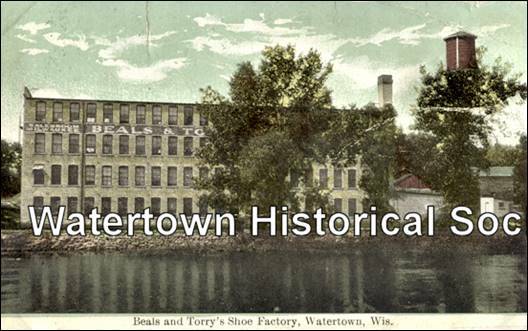 The shoe factory at West Milwaukee and Water streets, completed for the Beals & Torrey Shoe Company of Milwaukee, will be in operation about December 1 and employ about 125 persons. The factory is of brick, four stories in height. It is 150 feet long and 41 feet wide, with an additional boiler room and coal bunker at the north end, together with a steel water tank, seventy feet from the ground, which will be used in the operation of an automatic sprinkler system in case of fire. There are 225 windows in the building and gas and electricity have been installed, the latter to be used for power. It will be heated by steam. The building is constructed with a view to perfect sanitation and comfort of employees. The cost of construction was about $30,000. C. Huenefeld of this city was the contractor and the workmanship throughout is of the best character. F. L. Lindsa, was the architect. Saturday morning the writer visited the Beals & Torrey Shoe Co's factory and was surprised at the amount of work performed and the exceeding friendliness of the factory in each and every department. 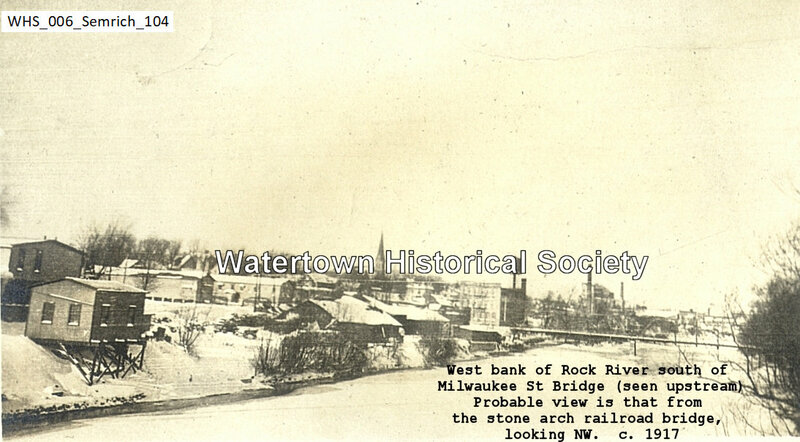 The factory is located at the corner of Milwaukee and Water streets, is built of white brick, and there stories above the basement and is an imposing structure and a credit to both the company and the city. At the present time over one hundred and twenty-five hands are employed in the factory, and footwear for men women, youths and children are manufactured, there being several grades of each, running from the common up to the very finest shoes being made, such as any lady or gentleman would wear with the satisfaction of knowing that they were well shod. The daily out-put is 800 pairs each working day, each passing through the several departments and finally and lastly to the polishing department under Foreman Devine, where they are finished for the trade. The machinery in use is of the latest, and is a marvel of the ingenuity of man, and many of the machines work as if possessed of intelligence, which one can watch with interest by the hour. The wages paid monthly amounts to a large sum and is a great help to the city in furnishing employment for many people at good wages which are promptly paid. Later the firm name was changed to the Beals Pratt Shoe Manufacturing Company. 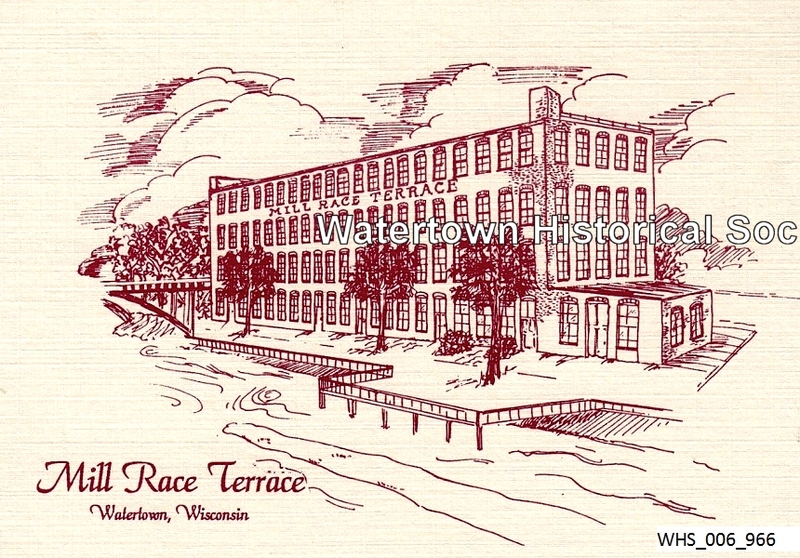 The present factory building of the Walter Booth Shoe company was built by this firm in 1919, and operated by it until 1925, when it became the Walter Booth Shoe Company. From less than 100 employees when Waller Booth affected the organization in 1925, the firm now employs approximately 500 men and women and at one time had as high as 600 employees. W. A. Schumann is the factory superintendent. The Walter Booth Shoe Company makes men's dress shoes exclusively that retail from $4.00 a pair to $7.50 a pair. The distribution is national. There are 26 salesmen selling the shoes throughout the entire United States. It also has distribution in the Hawaiian Islands. 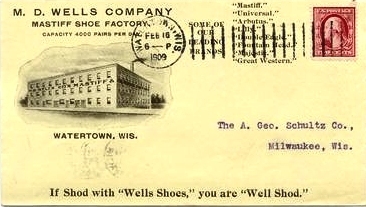 The trade names used by the Walter Booth Shoe Company are "Walter Booth" shoes, "Crosby Square Authentic Fashions," and "Crosby Square Flexible shoes." The "Crosby Square" name has been nationally advertised for several yours in magazines like, Esquire, Time and the Saturday Evening Post. The name is well known throughout the United States by people in the shoe business as well as consumers. "Crosby Square" shoes are retailed by some of the finest stores in the United States. An example of a few of them are: Mabley and Carew, Cincinnati, Ohio, M. R. Baker Company, Toledo, Ohio: Maurice L. Rothschild, Chicago; Minneapolis and St. Paul; Daniels and Fisher, Denver, Colorado, Sommer and Kaufmann, San Francisco. Calif., Glide's, Los Angeles, Calif., Bon Marche, Seattle, Washington, Stone Shoe Company, Cleveland, Ohio; Sakowitz Brothers, Houston, Texas and Dreyfuss and Sons, Dallas, Texas.